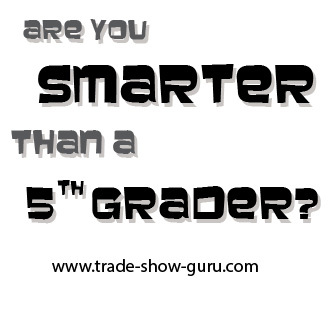 Alternate Title #1) Are You Smarter Than A Fifth Grader? A family of four came to a bridge at night to cross a river. Dad can cross the bridge in 1 minute. Mom can cross in 2 minutes. The Toddler can cross the bridge in 5 minutes and the Grandma can cross the bridge in 10 minutes. They have one flashlight that they have to carry when crossing the bridge. The bridge can hold only 2 people at a time. How can the family cross the bridge in 17 minutes? I tried to solve it, but kept coming up with the fastest time being 19 minutes, not 17 minutes. I repeatedly asked my son if there were any “tricks”, such as the dad carrying the toddler, but my son told me the teacher said there were no tricks. I finally gave up and “googled” the logic problem, and found the solution (isn’t Google wonderful?). I was embarrassed to discover the solution was very straightforward, and did not involve any “tricks” at all. So I ask you, can you solve the logic problem above? If you can’t, I’ve listed a hint below, which tells you the first step. But try to solve the problem without looking at the hint. If you still can’t solve the problem after looking at the hint, even further down I’ve listed the answer. But before we get to the hint or the answer, I’m going to address two things… (1) this logic problem is a great example of fast thinking vs slow thinking, and (2) how this post relates to trade show marketing and marketing in general. My wife told me a while back about a video she watched on youtube with our kids that discussed “fast thinking” vs “slow thinking”. Basically, the theory is that the human brain has evolved over time to use fast thinking and slow thinking. Fast thinking occurs when we quickly reach conclusions using readily available “facts” as well as our remembered experiences. It’s an important survival skill when one is facing imminent death (such as a charging bull) and one must make a quick decision. Slow thinking is when we take our time and puzzle over all the information, sorting it and trying every possible solution. However, fast thinking has become our default way of thinking for most people. It’s probably the source for the phrase, “Jumping to conclusions.” And unfortunately, often times, once “fast thinking” has given us the most apparent (obvious) solution, it often keeps us from being able to slow think and see other solutions. In the case of this logic problem, I’m convinced I fell victim to the “fast thinking” side of my brain, which quickly determined the “best” and fastest way to get the flashlight back across the bridge, and once I “knew” it was the best way, I didn’t consider any other ways. I didn’t take the time to slow think my way through the problem. I had solved the problem and the “fastest way” was 19 minutes, so I convinced myself that to do it in 17 minutest must involve a trick in the way the problem was written. But I was wrong. My fast thinking brain couldn’t get passed itself and see the big picture and the other better (and correct) way of solving the problem. (2) HOW DOES THIS POST RELATE TO MARKETING? If you’ve read my blog for a while, you’ll know I don’t always or only write posts about trade show marketing, or marketing in general. This is what I call a hybrid blog, which is a fusion of marketing advice and my own personal posts, which may or may not have anything to do with marketing, or may just be about random stuff. But in the case of this post, it does relate to marketing, as well as trade show marketing. Trying to solve this logic problem demonstrates the danger of fast thinking and jumping to conclusions. The key to solving the problem, in a way, is the same as the key to truly successful marketing. You need to slow think and think outside the box. The safe way to approach marketing is to just copy other people (hopefully successful people) but the results you get will just be the same at best. If you want to truly out-market your competition, you need to think outside the box. As a brief aside, an example of a company that is “thinking outside the box” (or in today’s pop lingo is a “market disruptor”) is a company I admire (and use) called Republic Wireless. They aren’t just thinking outside the box, they are redefining the “box” commonly known as “what should cell phone service cost”. Republic Wireless is lowering the cost of smartphones and smartphone service. I think a lot of people, if not most people, think that a smart phone costs at least $500, and the monthly service for smartphone should cost $50 to $100 a month. Many people think their only options for service are the big four carriers, AT&T, Verizon, T-Mobile, and Sprint. They may have heard of other cell phone service providers, but they only consider the big four. Well, there are other options, and the one we use and love is called Republic Wireless. You can read my Republic Wireless review here. Republic offers three very capable Motorola smartphones for $129, $199, and $249. More importantly, Republic offers unlimited talk and text plus unlimited wifi data for $10 a month. Yes, 10 bucks a month. With the $10 plan, you only get data over wifi (and not cellular data) but if you need cellular data, you add it to the $10 base for $15GB, and then Republic Wireless refunds you each month for any cellular data you don’t use, so you only pay for the cellular data you actually use. The big four carriers may seem to give you a lot of cellular data (for a hefty monthly price) but then they keep the money for the data you never use. But in the end this post isn’t about Republic Wireless (though if you want to save money on your smartphone service you should really check them out). So back to the topic on hand… can you solve this math logic problem of how to get the family of four over the bridge in 17 minutes? The first step is to send the Dad and the Mom across the bridge. This takes 2 minutes. You now need to get the flashlight back. Draw a diagram of where people are now. Then do the problem one step at a time, always considering where everyone is. Don’t fast think. First you send the dad and mom over. This takes 2 minutes. Then you have the dad bring back the flashlight. This takes 1 minute. MOM STAYS ON THE OTHER SIDE. Now the toddler and grandma cross. This takes 10 minutes. Then the mom brings back the flashlight. This takes 2 minutes. Now the dad and mom cross the bridge. This takes 2 minutes, and now everyone is across. The total time is 2 + 1 + 10 + 2 + 2 = 17 minutes.